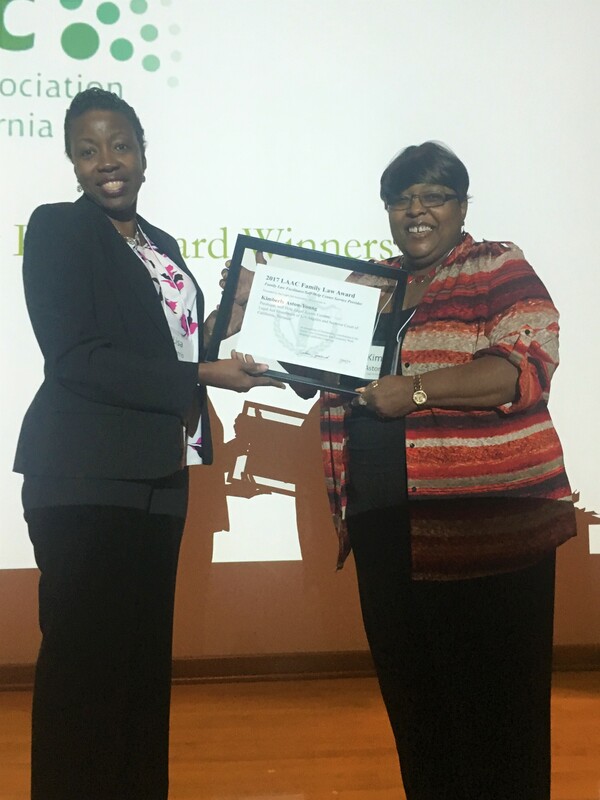 Paralegal Kimberly Aston-Young (right) is presented the Family Law Award by Lisa Morris, a managing attorney for the Legal Aid Foundation of Los Angeles. Kimberly Aston-Young provides legal assistance in the self-help center of the Torrance courthouse, which sees 900 litigants per month. 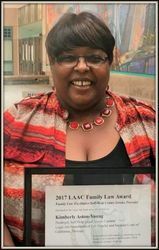 Kimberly Aston-Young, a paralegal who for twelve years has dedicated her career to delivering legal aid for self-help litigants, received the 2017 Family Law Award at this year's Family Law and Self-Help Conference. The training conference was co-sponsored by the Legal Aid Association of California and the Judicial Council. Aston-Young provides legal assistance at the Los Angeles County Courthouse in Torrance, one of four self-help centers run by the Legal Aid Foundation of Los Angeles. Aston-Young attributes her experiences of nearly 30 years ago as motivation for serving self-represented litigants today. "I've been on the other side, a single mother going to school and filing for divorce," says Aston-Young. "There was no help back then so I got my knowledge from books and my colleagues. I was working as a file clerk and as soon as the self-help center opened, I applied." Co-workers say Aston-Young is an asset to the center, valued by her peers for her wealth of knowledge in family law, positive attitude, and interpersonal skills. They agree the impact she makes on the community is worthy of the recognition. "Kim is a model of the best customer service behavior and attitude," says center volunteer Joan Arias. "Our clients come to our center completely stressed and leave with a sense of confidence that they can help themselves." Seeing an average of 900 litigants per month, 80% of them being family law cases, Kimberly and her staff must be prepared to help individuals with difficult family law matters. Much of Aston-Young's satisfaction comes from mentoring the center's student volunteers, which include 13 members of JusticeCorps, a grant-funded program administered by the Judicial Council. "Nothing makes me happier than passing on the knowledge and experiences I have to the litigants coming in every day and to the wonderful volunteers from JusticeCorps who truly make a difference and keep the self-help center running efficiently."